This small, yet handy High Power Magnifier is light weight as well as very functional. It can be used for close inspection of items like circuit boards, hallmarks, stamps, coin collectors, hobbyists and collectors of antiques. With 2 LED and ON/OFF switch, it is ideal for assistance in low-light conditions. 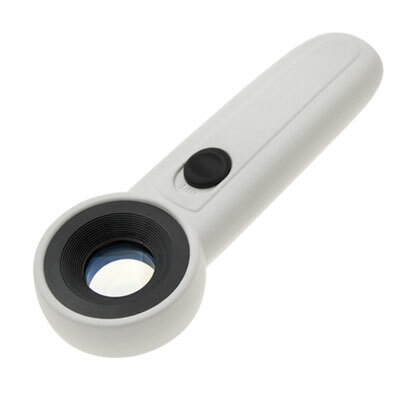 High Power Magnifier is convenient for your home, office and travel. 20x magnifying glass required immediately for our laboratory use. we are a producer of plastic laboratory wears please send offer and contact..
Good day to you....I am Ms.Sally from Penang, Malaysia. Address : Pusat Bandar Sunway, Seberang Jaya, Prai, Penang, Malaysia. Your soonest reply is really appreciated.